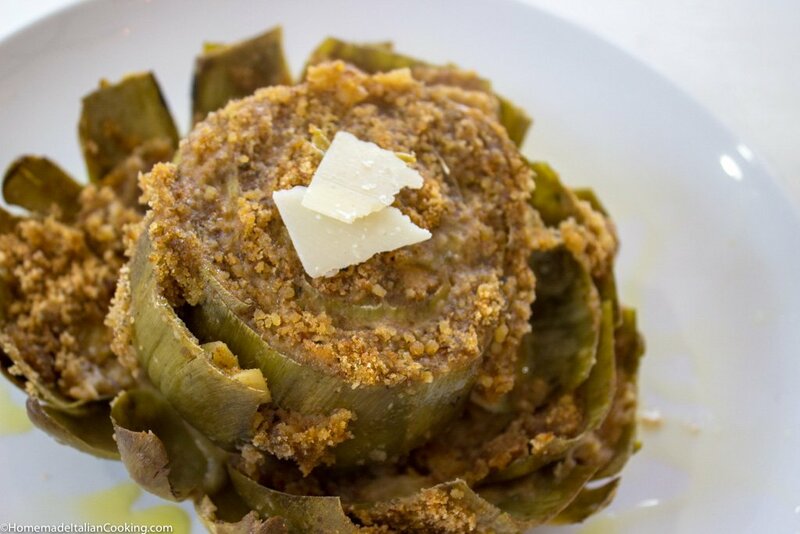 Stuffed Artichokes loaded with Parmesan and Garlic is a specialty of my Aunt Florence. 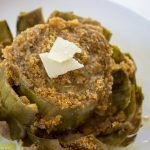 Her artichokes are a favorite of the Cipolla family, and I was thrilled when her son and my cousin, Ron gave me the recipe. 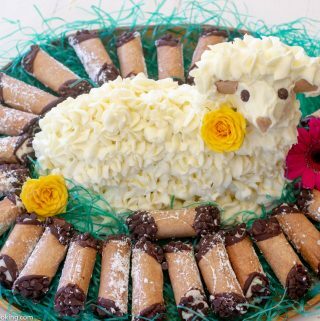 This is Sicilian cuisine at its finest. 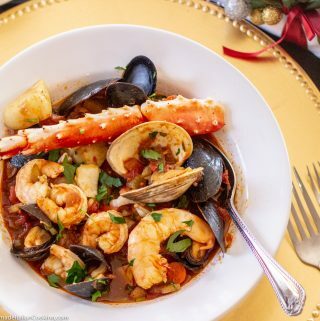 Like all good Italian food, the quality of the ingredients matter. 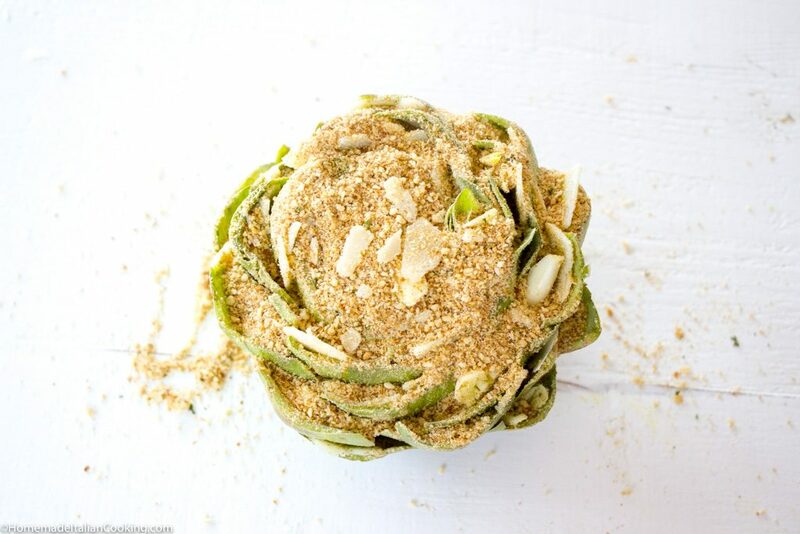 Use fresh artichokes and garlic from California, imported Parmigiano-Reggiano cheese, a high-quality extra virgin olive oil, and a good brand of Italian seasoned breadcrumbs. Of course, you can make your owned seasoned breadcrumbs. My cousin Ron likes to blend a good quality Pecorino Romano cheese with Parmigiano-Reggiano as well. One whole artichoke would be a meal for me. Share one with a friend for a wonderful appetizer. Each leaf oozes with cheesy goodness and roasted garlic in a toasted breadcrumb nest. The artichokes are trimmed, stuffed and steamed for about 45 minutes. 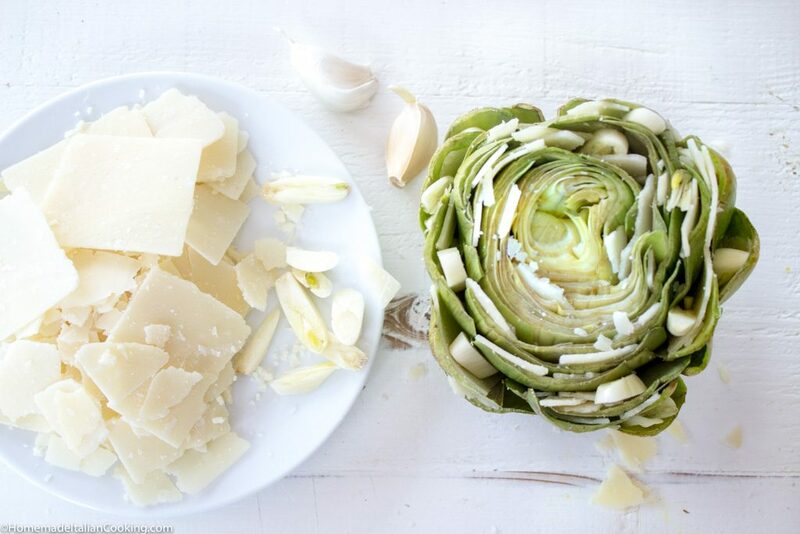 The recipe calls for 3 cloves of garlic per artichoke and lots of shaved parmesan slices – enough for one slice per leaf! With kitchen shears, snip off any remaining sharp tips. 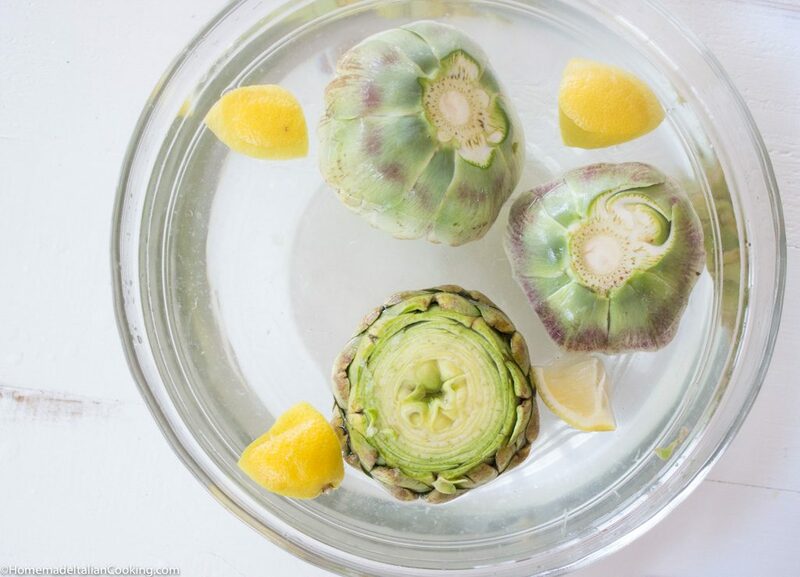 Dunk the trimmed artichokes in lemon water to prevent browning while you trim the rest. Working on one artichoke at a time, firmly pull the leaves apart to create little pockets. 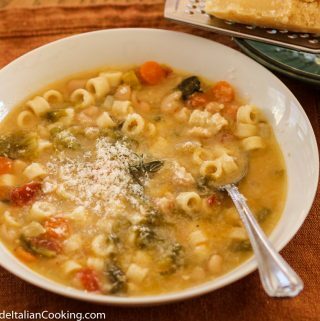 Stuff each leaf with a slice of Parmesan/Romano cheese and a slice of garlic. 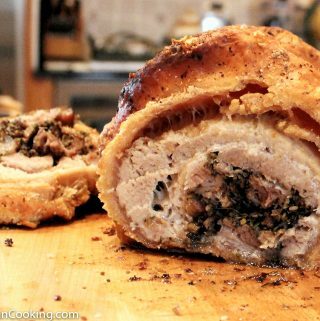 Gently open the pockets and carefully pour seasoned breadcrumbs over the leaves, stuffing as much as possible in each one. 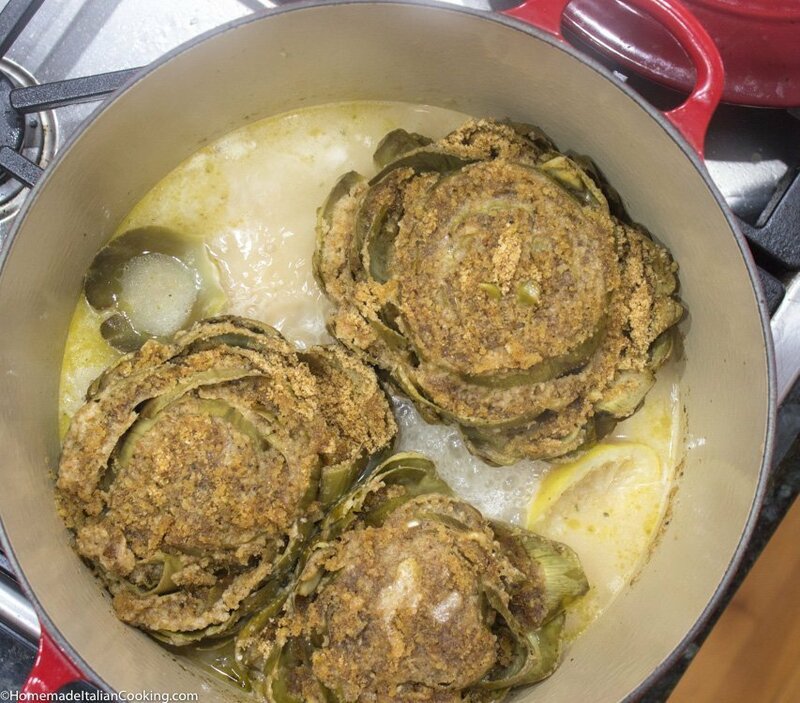 Place the stuffed artichoke on a lemon slice in a large Dutch oven on the stove top. Repeat until all artichokes are stuffed and ready to steam. Drizzle olive oil on top of the breadcrumbs to coat. Cover the bottom inch of the pan with water. Cover the pan and bring to a boil, then lower to simmer. Cook for 45 minutes, checking the water level every 15 minutes. With a large slotted spoon, carefully remove each Stuffed Artichoke and transfer to serving platter. Serve with a side bowl for discarded leaves. 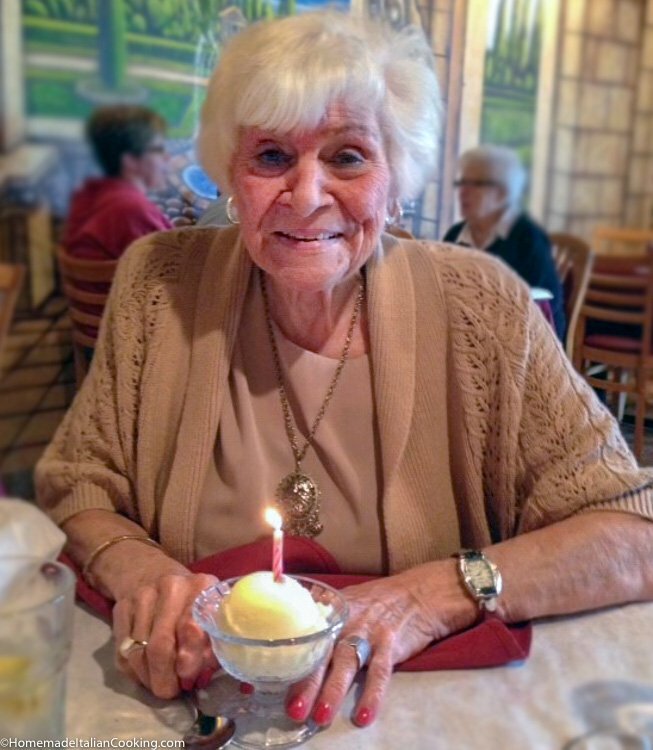 My beautiful 98-year-old Aunt Florence passed away recently. 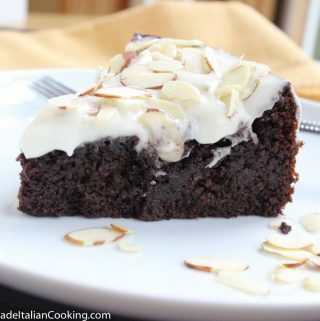 Posting her recipe is one way to honor this amazing woman. She will be greatly missed. 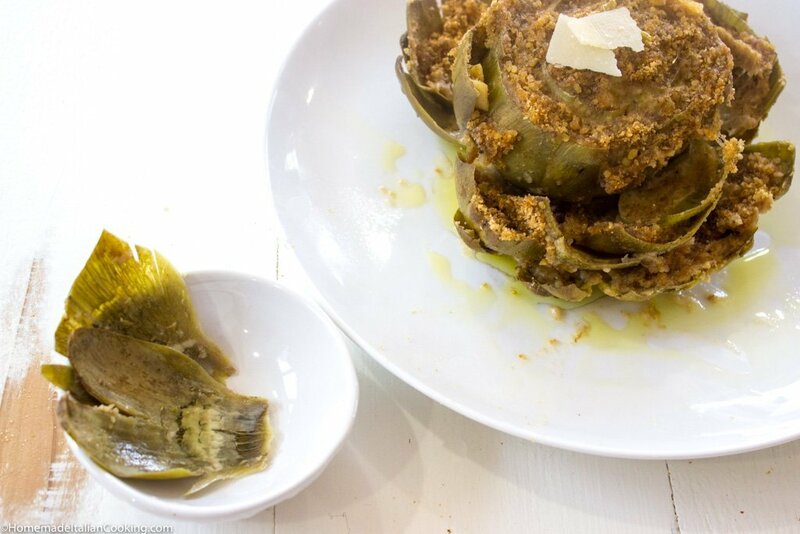 Artichokes stuffed with Parmesan and garlic is amazing. 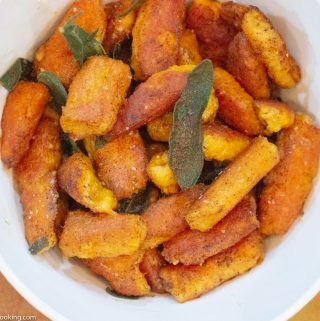 Each leaf oozes with cheesy goodness and roasted garlic in a toasted breadcrumb nest. The artichokes are trimmed, stuffed and steamed for about 45 minutes. 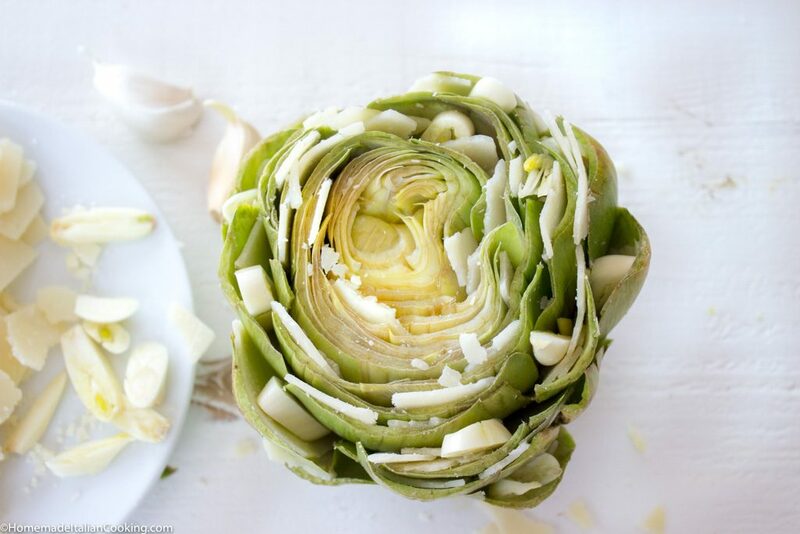 The recipe calls for 3 cloves of garlic per artichoke and lots of shaved parmesan slices – enough for one slice per leaf! Prepare a large bowl of cool water big enough to hold the artichokes. Cut one lemon in quarters. Squeeze three quarters into the water and throw the used quarters in the bowl. Save the last lemon quarter. To trim the artichoke: Remove large, hard leaves at the base. Cut the stem off to create an even base for the artichoke to sit on. 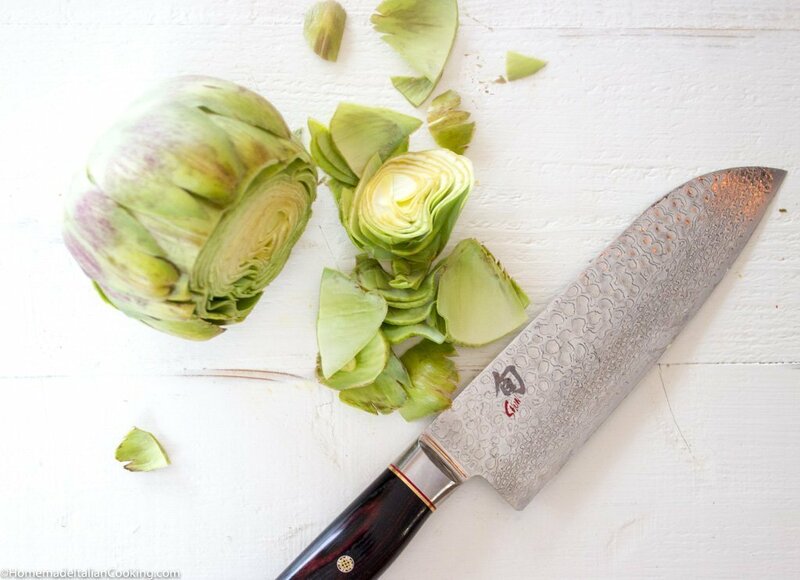 With a chef’s knife, lay the artichoke on its side and cut off the approx. 1 inch tip of the artichoke including most of the leaves with sharp tips. 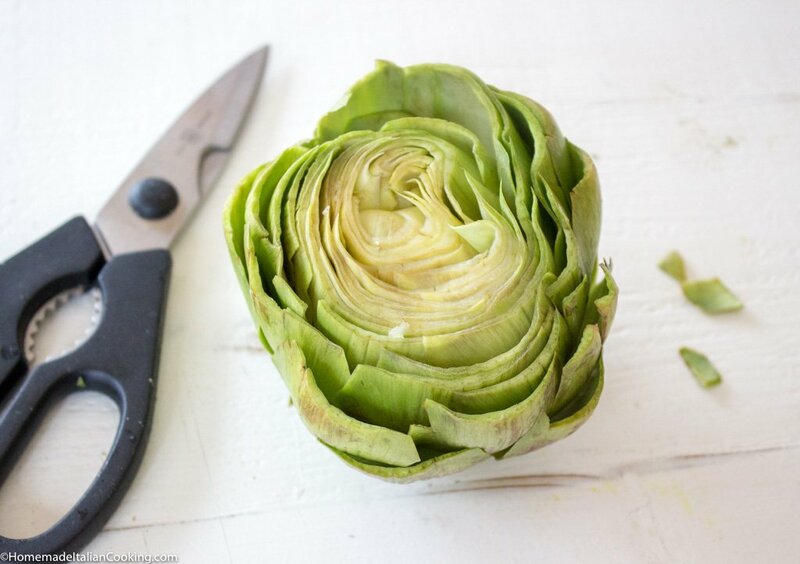 With a kitchen shears, snip off any remaining sharp points off the remaining leaves. With the remaining lemon quarter, rub the lemon on the cut top to prevent browning. 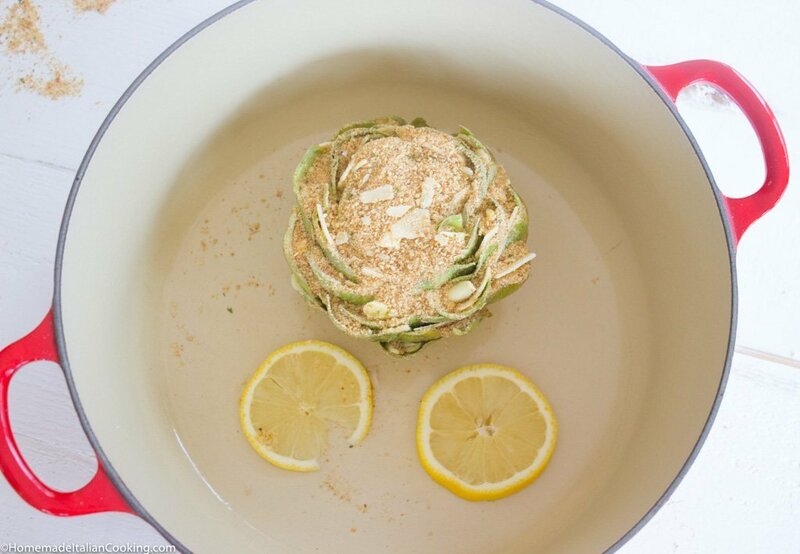 Submerge the trimmed artichoke in the lemon water while preparing the remaining artichokes.Take out one artichoke. Turn upside down on a wooden board and press down gently with your palm to open and loosen the leaves. Turn upright, and with your fingers, firmly spread the leaves apart to make pockets. 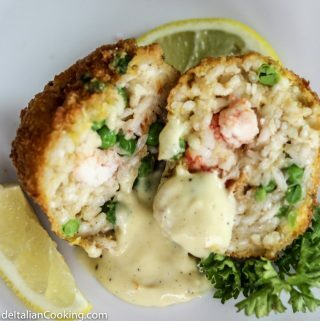 Place one slice of Romano/Parmesan cheese in each leaf pocket, stuffing as many leaves as you can. The inner, light green leaves will not open. 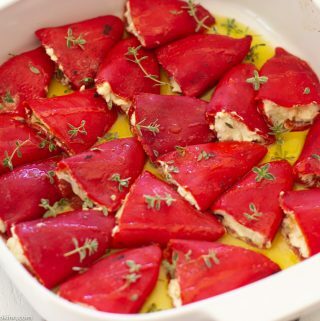 Place a slice of garlic in each leaf pocket along with the cheese. Use approximately 3 cloves of garlic per artichoke. Place the artichoke in a small bowl. 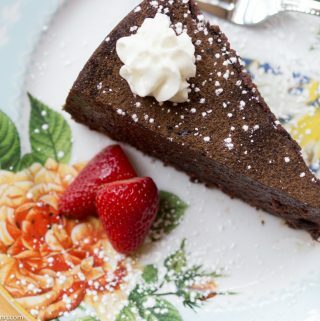 Spread ½ cup breadcrumbs over the top, pushing the breadcrumbs down into the leaves with your fingers. 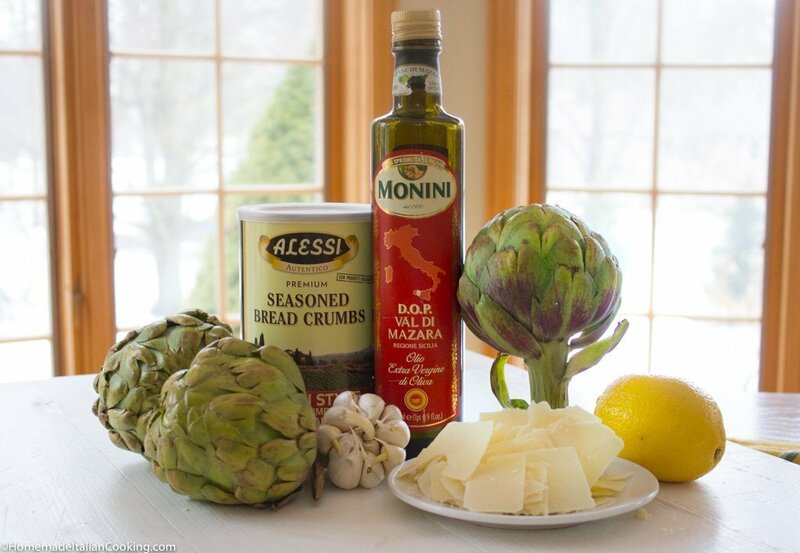 Drizzle one tablespoon of olive oil over the top of each stuffed artichoke. Place three lemon slices in the bottom of a dutch oven or large covered pot. 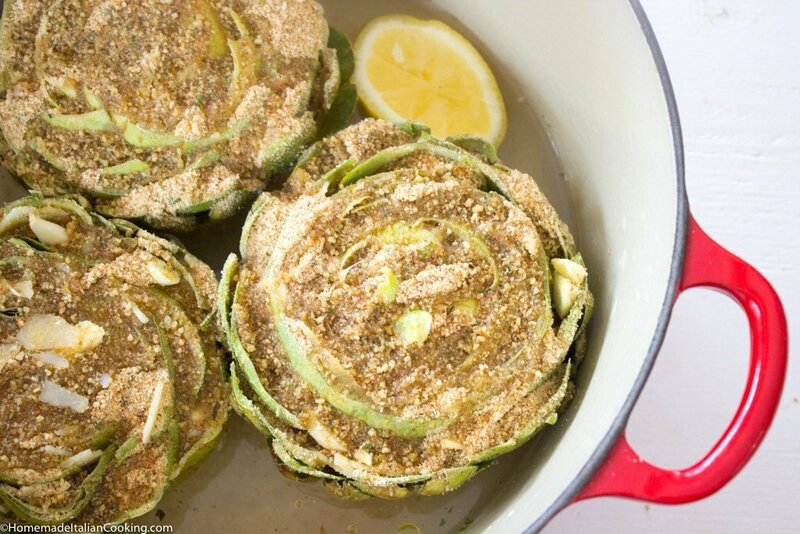 Place the stuffed artichokes on a lemon slice. It should be stable and not tip over. Carefully pour enough water to cover about 1 inch of water in the pot, careful not to get any water on the artichokes. Cover the pot, and cook on medium high heat until the water boils. 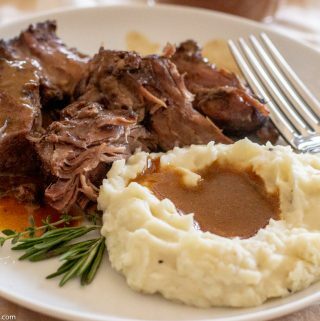 Lower the heat to simmer, and continue steaming for about 45 - 50 minutes. 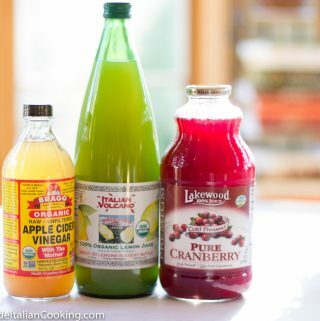 Be sure to check the water level ever 15 minutes and add more water if needed so it does not dry up. 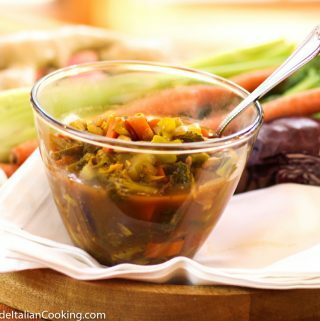 Remove the artichokes with a large slotted spoon to a serving plate. 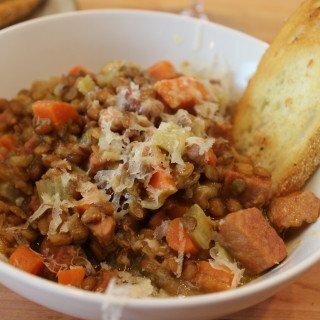 Drizzle with more olive oil. 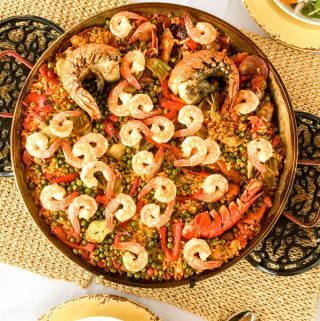 Serve with lemon wedges and a small bowl for discarded leaves. Ron sent this tribute of his Mother to me, and I thanked him. Wonderful that you honored your Aunt Florence. She was one of the sweetest ladies….always smiling and gracious. 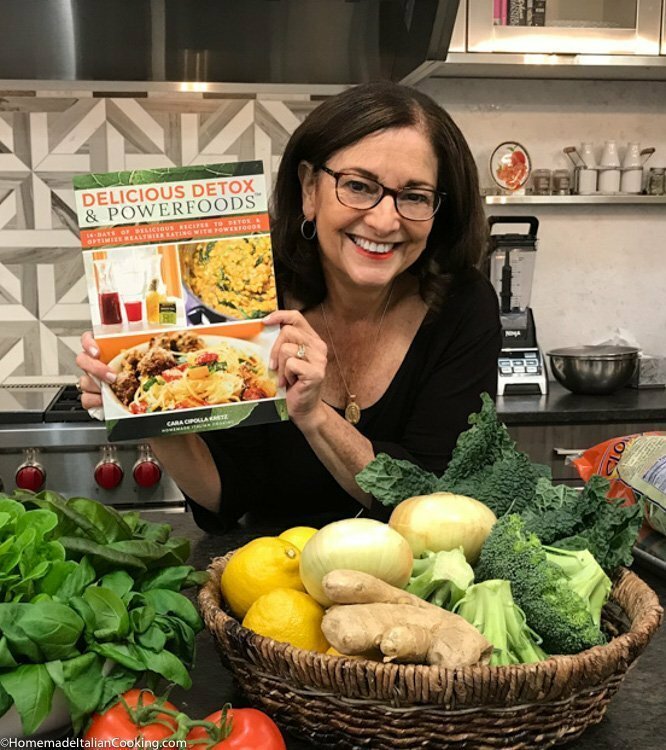 I am a former food editor, of both the Chicago Sun-Times and Cuisine magazine, and have written 17 books on food…cookbooks, wine-and-food pairing books, and dining guides. I’ve been teaching culinary/wine classes for decades: at College of DuPage, then Wright College, and lately at libraries. My upcoming class at Eisenhower Library on March 8 focuses on spring. I’d like to include Florence’s artichoke recipe and include your contact information for my students. I cap my classes at 30. I’m in the process of typing handouts now—hope to finish by Monday. What is your website or email? Thank you.